Bead crochet is popular and for good reasons. Many items that are bead crocheted are lovely pieces that have a “hand” that is wonderful. “Hand” refers to the texture and drape or feel of the piece as you use it. Bead crochet gets rid of the stiffness of peyote, or Ndebelle, or square stitch. The items are great to wear and to look at. Interweave Press has brought out a book that is one of the books in their how-to series that speaks to a need in the bead world, that of Bead crochet. The illustrations are in color which helps show where the thread is coming and going. Basic crochet stitches are written and illustrated. There is a history that covers most of the more recent history as well as the reason that history exits. Lots of illustrations and photos are included. 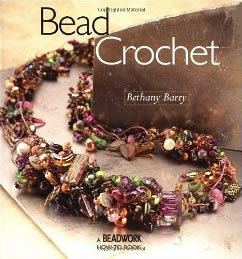 Bethany Berry says, “Crochet is an extremely forgiving stitch and . . . crochet mistakes are easy to pull out and redo, or hide.” Now, that is a great recommendation. The other really great recommendation is the number of projects you find in the book. It goes from earrings to brooches, to boxes, to classic or not classic ropes and bracelets to purses. Plenty of beads to put on the string/yarn and you are a happy camper, er, beader.